Cam Perlinger (14) of the West Central Peewee Wheat Kings celebrates as the puck goes by goalie Miller Klein and into the Saskatoon Thunder net. Teammate Cole Reschny scored it, one of four goals he had in the game. Thunder players Kayson MacDonald (8) and Brayden Smith (9) watch. 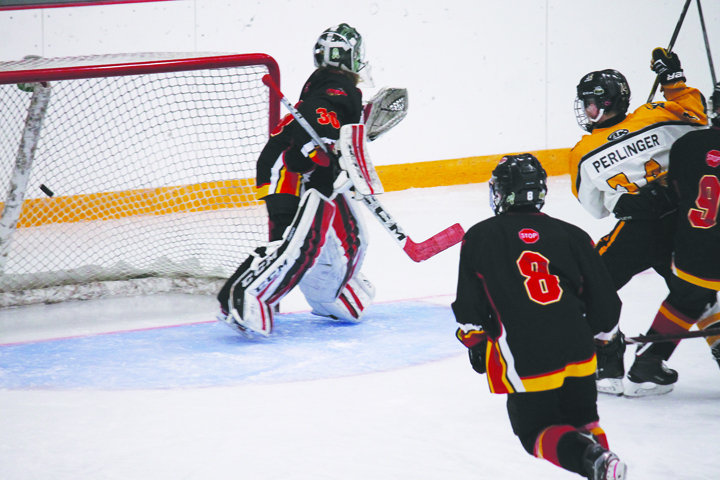 The peewee Wheat Kings hosted the Thunder in an exhibition game in Rosetown on Sunday, beating them 8-5. Their next league action is a three-game home stand in Kinderlsey on Nov. 23-25. West Central Wheat Kings bantam and peewee teams both played Saskatoon teams in Rosetown on Sunday and recorded a loss in league play and a win in exhibition, respectively. The bantams play in Martensville on Thursday, Swift Current on Saturday and Moose Jaw on Sunday. The next league action for the peewees is a three-game home stand in Kindersley on Nov. 23-25, hosting the Prince Albert Knights on Friday and Saturday and the Humboldt Broncos on Sunday.